Don't just focus on your career, start focusing on steps to financial freedom. I'm not one of the rare lucky ones that live the "free life" in their 20s. However, I have started to take the important steps to financial freedom. This post is about what I have learned in the last ten years that have got the ball rolling. Have you heard of Freedom 55? You know those commercials promoting retiring early? I don’t know if I want to ever stop working. But I do want to stop working at jobs I dislike just for a paycheque. Taking early steps to financial freedom will let you focus on your passions and not worry about money. Why Take Steps to Financial Freedom? This might seem like an obvious or stupid question because who really wants to work? Just to be clear when I’m talking about steps to financial freedom I’m not talking about winning the lottery or inheriting a large sum of money (although both would be nice), I’m talking about putting your income on auto-pilot. The best way to put your income on auto-pilot is to create multiple streams of income. When I became a home owner in 2008 it was the beginning of the recession. It scared me how dependent I was on one job to support myself. That’s when I consciously decided to do something about it. 2. Don’t’ adjust your spending habits as your salary increases, adjust your saving habits. This is the simplest activity of the steps to financial freedom. Here’s a big one: as your salary increases from year to year, increase the amount coming out of your auto-withdrawal. My thoughts are if you were able to survive on last year’s salary, you should have no trouble continuing it. Don’t under-estimate the power of compounded interest. It can lead to an early retirement. 3. Never stop learning. I didn’t exactly excel in university because I hated being in school full-time, but I love taking courses part-time while I work. It is key to do this in your 20s because this is age when you have the most free time. Most of us are delaying getting married and having children until later on. The upgrading courses I have taken in my early 20s have helped me advance in my career and will continue to. They have set me apart from my colleagues and complimented my existing work experiences. And if you’re lucky enough, your company might even pay for it. Career advancement almost always guarantees a larger paycheque (which means more money to save!). See my point??? 4. Don’t tie yourself down to a big mortgage or rent so early in life. I purchases my first place only weeks after changing jobs which was a gamble. What saved me is that I purchased something with my previous salary, not my new one In your 20s your salary is going to be the lowest you’ll make until your retired. Many might see that as a chance to grow into their mortgage. I’ve taken the opposite approach. I bought something that was just the right side for me. Properties are a lot of responsibility- you still have to furnish them and pay bills. I have the perfect starter place for a small family too. I bought it off a couple with a young child. As my salary has increases I can pay down my mortgage, save more or free up more money for personal development and vacations. It’s a win-win situation. 5. Start a blog or a website. This is the most fun activity of the steps to financial freedom. Roughly around the time I bought my place and wanted to start creating multiple streams of income, I learned about others that have created successful website or blogs that generate income. After a couple of months of research I decided to go with Site Build It! because of its huge success. Depending on what you talk about, you can start building a second career or brand. Site Build It! does all the technical work by giving you the tools to success. It costs approximately $300 US a year (or $30 a month) but if you follow the program you’ll be able to generate a passive income successfully. WAIT!!! We’re not done yet. 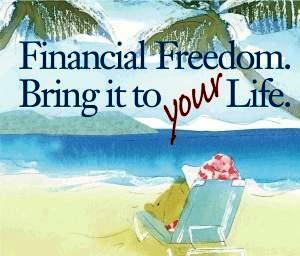 For the next five steps to financial freedom click here.